“Scorecards are your blueprint for success. They take the theoretical definition of an A Player and put it in practical terms for the position you need to fill.“, as Geoff Smart and Randy Street wrote in their book WHO. It all starts with the definition of the right position for your organization and putting everyone in the right position. Finding great talent is hard. But how is your strategy to fill the position with an A Player? You can hire employees with the needed skills, temporary contract employees with the respective skill set, or build it by developing the skills in-house. But in any of the three ways and especially in the third way it is essential that you continually invest in your employees with successful development and ongoing training, or as BCG calls it in their “CEO’s Guide to Leading and Learning in the Digital Age” – the initiating of “learning in the workflow”. The best employees will be learning throughout their lives, and this learning will take place at work. According to this a B Player today might be an A Player tomorrow and on the other hand an A Player today is not necessary an A Player tomorrow. The Job Scorecard is not only the blueprint for your hiring process. The scorecard is the basis for the hiring process and serves as a continuous improvement tool during the ongoing learning process. Align your people with your business objectives and make your good team great! Run effective one-to-one meetings with your employees – once per month or quarter instead of once per year – and create value for your people and for the company. The Flowmotor Job Scorecard is the tool for planning, structuring, execution and documentation of the development interviews with your employees. 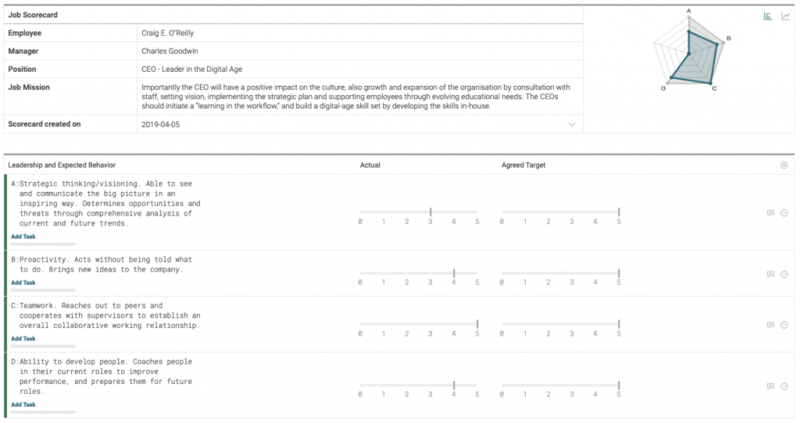 How to introduce the Job Scorecard to your team? It is best to start with yourself. 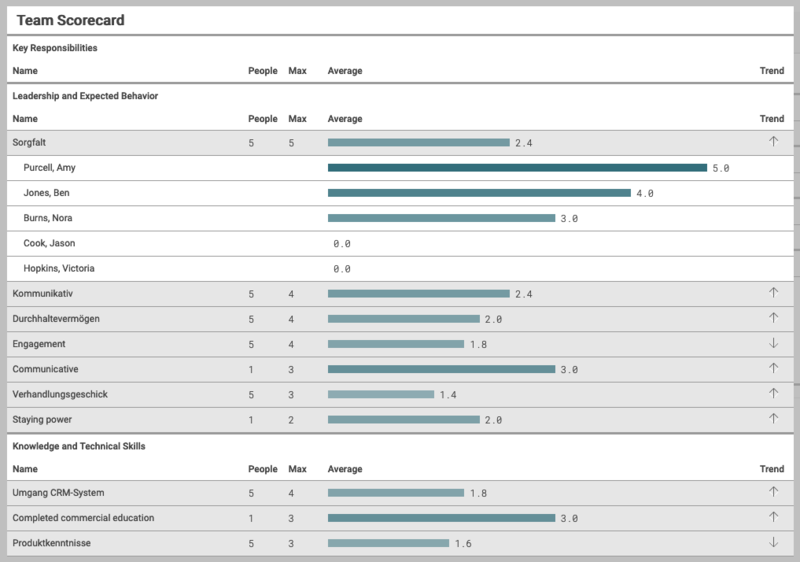 Fill out your own Job Scorecard, present it to your team and collect feedback. In the coming chapters you find a step-by-step example of a CEOs Job Scorecard. The Core Values are taken directly from the organisation’s strategic plan. How does the behavior demonstrating and understanding of and alignment fit with the organization’s stated Core Values? What specific actions, tasks or areas of responsibility will this role oversee? What specific leadership skills and behaviors are necessary to be successful in this role? What specific knowledge, competencies, and technical skills are necessary to be successful in this role? What visible and measurable outcomes define the success in this role? 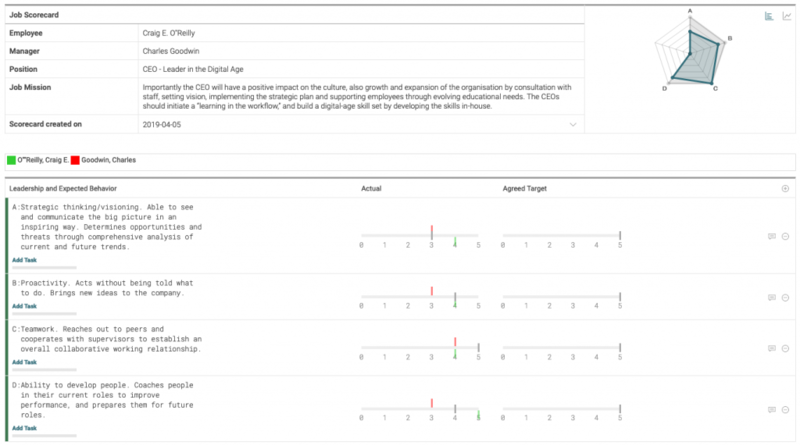 The Job Scorecard is optimized for use on a tablet PC. At the end of the one-to-one meeting both the manager and the employee can complete and sign the scorecard. The Flowmotor people module not only supports the one-to-one meeting. Both the employee and the manager can assess all criteria of the scorecard in advance of the meeting and so streamline the meeting process itself. 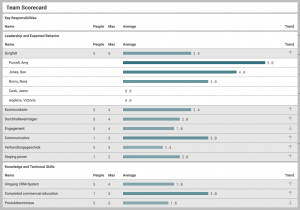 Based on the scorecards of each team member you will get a summary of all skills of your team in the Team Scorecard. What about connecting the Team Scorecard with the strategic objectives of your organization? We are currently planning to link these two elements. Starting with one of the upcoming Flowmotor releases you will be informed when your team lacks the skills to achieve a specific goal. You are just one step away from filling out your first Job Scorecard. Create an account and start your 90-day FREE trial now: https://secure.a3flow.com/demo/trial/register. Many thanks to Geoff Smart and Randy Street for providing some great ideas for a scorecard in their book WHO and many thanks to Geoff Smart to have you live on stage at the Scale Up Summit on October 16-17 in Denver, CO. Thanks to BCG for the article “A CEO’s Guide to Leading and Learning in the Digital Age” that includes some ideas for the example scorecard on this page.